A microscope slide is a thin flat piece of glass, used to hold objects for examination under a microscope. 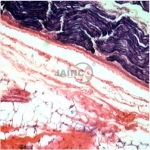 Usually the object is mounted on the slide, and then each are inserted along within the microscope for viewing. This arrangement allows several slide mounted objects to be quickly inserted and off from the microscope, labeled, transported, and hold on in acceptable slide cases or folders etc. 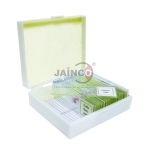 Microscope slides are typically used together with a cover slip or cover glass, a smaller and thinner sheet of glass that is placed over the specimen. Slides are held in place on the microscopes stage by slide clips, slide clamps or a cross table that is employed to attain precise, remote movement of the slide upon the microscopes stage. Jainco is renowned Prepared Slides, Prepared Slides Suppliers, Prepared Slides Exporters, Prepared Slides Manufacturer, Prepared Slides in India, Prepared Slides Manufacturer in India, Slides, Prepared Slides Exporters in India. High-quality yet affordable, this prepared slide set is great for teaching students about animal body parts. This beginner prepared slide set is great for introducing the world of microscopy to students. High-quality yet affordable, this prepared slide set is great for teaching students about textile fibers. High-quality yet affordable, this prepared slide set featuring small organisms is great for introducing the world of microscopy to students. High-quality yet affordable, this Apologia Biology prepared slide set is great for introducing the world of microscopy to students. High-quality yet affordable, this basic botany prepared slide set is great for introducing the world of microscopy to students. High-quality yet affordable, this basic zoology prepared slide set is great for introducing the world of microscopy to students. High-quality yet affordable, this prepared slide set is great for teaching students about deadly human diseases. High-quality yet affordable, this human physiology prepared slide set is great for introducing the world of microscopy to students. 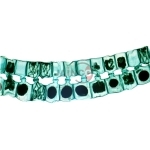 High-quality yet affordable, this prepared slide set features numerous intriguing specimens to study and is a great way to get students interested in biology. High-quality yet affordable, this mammalian physiology prepared slide set is great for introducing the world of microscopy to students.